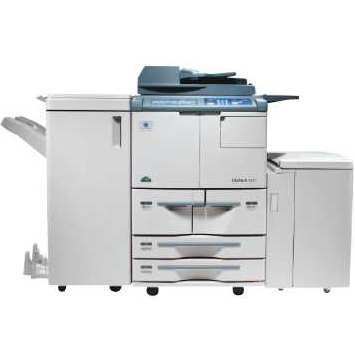 For large offices that need a heavy-duty machine to handle the versatile demands of the daily work day, the Konica-Minolta 7225 offers fast speed, professional quality, and multiple functions. It can serve as a scanner, copier, and printer, and includes a number of other built-in features that will increase the rate of production and simplify tasks. 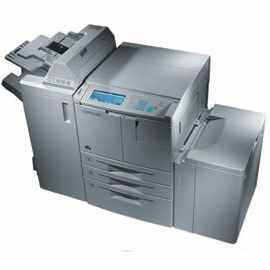 Though it is expensive off the shelf, the cost per printed page will be minimal considering the Konica-Minolta 7255 toner cartridges yield up to 47,500 pages. 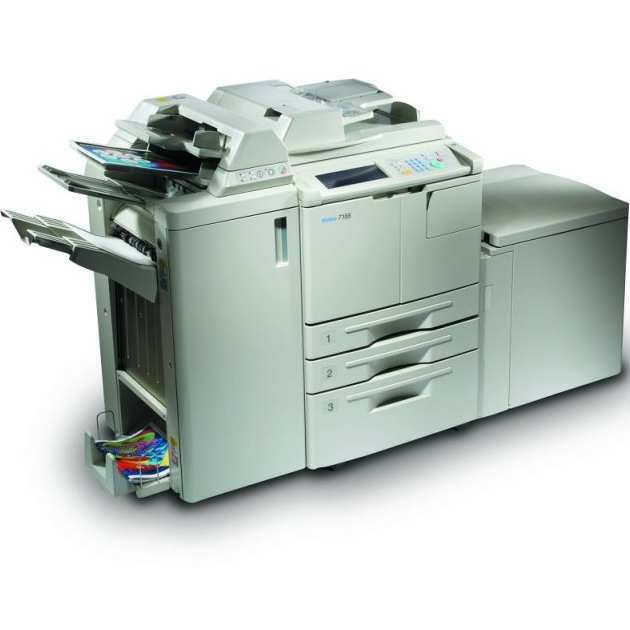 Designed to handle workloads in the busiest of offices, the 7255 has a monthly maximum print cycle of 300,000 pages. It boasts a 20 GB hard drive, a 566 MHz processor, and 64 MB of RAM, which can be increased to up to 576 MB if needed. The paper capacity is also upgradable. The base model offers a 1,500-sheet tray, 1,000-sheet tray, two 500-sheet drawers, and a 100-sheet bypass tray for specialty media. An optional tray holding up to 4,000 sheets can be added, making the maximum paper capacity 7,600 sheets. 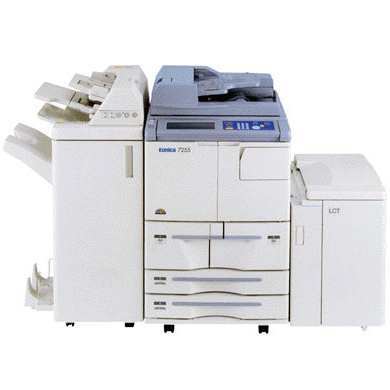 The 7255 is intended more for printing text documents or simple graphics, as the maximum resolution the Konica-Minolta 7255 printer toner can render is 600x600 dpi, which will leave much to be desired for complex images or graphics. What it lacks in quality, however, it makes up for with impressive output rates. 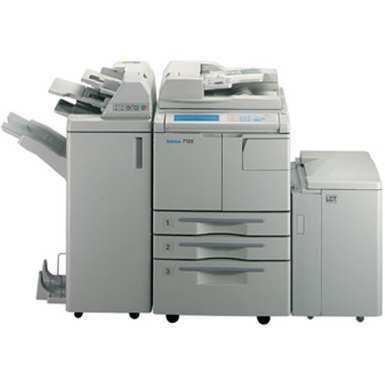 Up to 55 pages per minute can be printed or copied, and scans are processed at a rate of 70 originals per minute. The machine takes only about 5 minutes to warm up and the first page of a task will begin printing in less than 4 seconds. With a full Konica-Minolta 7255 toner cartridge installed, this unit weighs 450 pounds. The frame measures approximately 26x30x45 inches, which is not small but still considered a space-saver because it combines a number of essential pieces of office equipment. 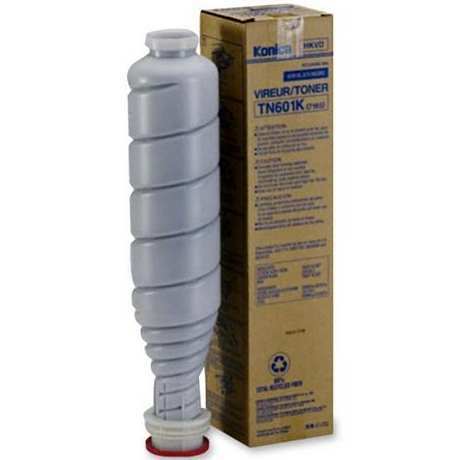 Replacement toners are rather easy to locate, as a number of online retailers offer them. Compatible only with Windows operating systems and cohesive with single-PC and network connectivity, this laser all-in-one is an excellent unit for big, busy offices. The high-yielding Konica-Minolta 7255 toner will keep things moving smoothly and affordably, while the built-in features and functions ensure optimal productivity.